0452 Italy is invaded by Attila the Hun. "...Attila returned in 452 to claim his marriage to Honoria anew, invading and ravaging Italy along the way; his army sacked numerous cities and razed Aquileia completely, leaving no trace of it behind. Valentinian fled from Ravenna to Rome; Aetius remained in the field but lacked the strength to offer battle. Attila finally halted at the Po, where he met an embassy including the prefect Trigetius, the consul Aviennus, and Pope Leo I. After the meeting he turned his army back, having claimed neither Honoria's hand nor the territories he desired. 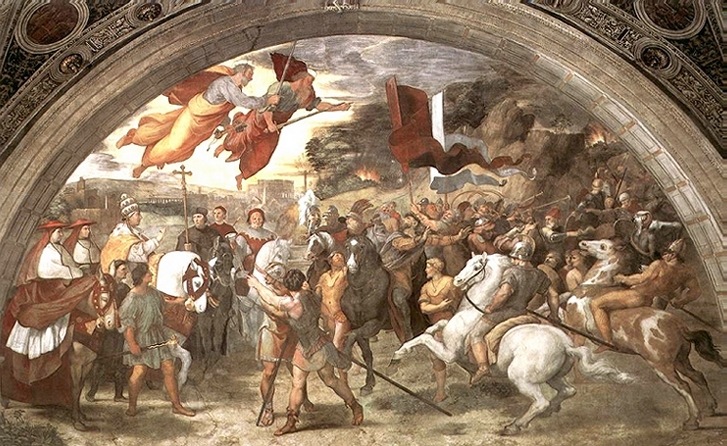 Raphael's The Meeting between Leo the Great and Attila (above) shows Leo I, with Saint Peter and Saint Paul above him, going to meet Attila. Several explanations for his actions have been proffered. The plague and famine which coincided with his invasion may have caused his army to weaken, or the troops that Marcian sent across the Danube may have given him reason to retreat, or perhaps both. Priscus reports that superstitious fear of the fate of Alaricâ€”who died shortly after sacking Rome in 410â€”gave the Hun pause. Prosper of Aquitaine's pious "fable which has been represented by the pencil of Raphael and the chisel of Algardi" (as Gibbon called it) says that the Pope, aided by Saint Peter and Saint Paul, convinced him to turn away from the city. Various historians (e.g. Isaac Asimov) have supposed that the embassy brought a large amount of gold to the Hunnish leader and persuaded him to abandon his campaign. Whatever his reasons, Attila left Italy and returned to his palace across the Danube. From there he planned to strike..."
0632 Death: Mohammed, propagator of the Koran, founder of the Islamic religion, in Mecca (according to tradition). 1042 Death: Hardicanute, King of England and Denmark. He is succeeded in England by his adopted heir, Edward the Confessor and in Denmark by Magnus, King of Norway. 1376 Death: Edward the Black Prince, son of Edward III of England. 1625 Birth: Giovanni Domenico Cassini, Italian astronomer; will discover 4 satellites of Saturn. 1697 Indians capture Hannah Duston and her child, among others, in an attack on Haverhill Massachusetts. Duston will escape on 29 April after killing 10 Indians with a tomahawk, and will be given the first-ever public award to a woman in America for her efforts. 1783 Iceland's Laki volcano erupts; a most violent of volcanic eruption, killing 9,350 people and causing a famine which will last until 1790. 1789 The American Bill of Rights is first proposed by James Madison. 1809 Death: Thomas Paine, radical revolutionary writer; at 72. "...A proto-anarchist, Paine advocated a liberal world view, considered radical for his time. He dismissed royalty, and viewed all government as, at best, a necessary evil. He opposed slavery and was amongst the earliest proponents of social security, universal free public education, guaranteed minimum wages and many other radical ideas now in common practice in most western democracies. Paine was a deist and fervent critic of organized religion, which led to social ostracism much of his life. Paine published an early anti-slavery tract and was co-editor of Pennsylvania Magazine. A republican, Paine became an articulate spokesman for the American independence movement. Paine is said to have been tarred and feathered in New Jersey, but no proof exists of this. Due to his unorthodox and unpopular opinions, scurrilous tales were circulated about Paine, first by the British, (during the time of the American Revolution), and later by his political opponents on both sides of the Atlantic. ...Purportedly in 1800, Napoleon met with Paine, and stated that "a statue of gold should be erected to him in every city of the earth". Paine did not like Napoleon, by all accounts. Paine remained in France until 1802 when he returned to America on an invitation from Thomas Jefferson. Derided by the public and abandoned by his friends due to his religious views, Paine died at 59 Grove Street in Greenwich Village, in New York City on June 8, 1809. At the time of his death, most U.S. newspapers reprinted the obituary notice from the New York Citizen, which read in part: "He had lived long, did some good and much harm." Only six mourners came to his funeral. A few years later the agrarian radical William Cobbett would ship his bones back to England, only to lose them in transit. Thomas Paine's writings have greatly affected Abraham Lincoln, Thomas Edison, as well as his other contemporaries such as George Washington. There is a museum in New Rochelle, New York in his honor, and a statue of him stands in King Street in Thetford, Norfolk, his place of birth." 1809 The Phoenix, built by John Stevens and the largest oceangoing steamboat in the world, leaves New York Harbor for Philadelphia, Pennsylvania. 1815 39 German states unite under an Act of Confederation. 1824 The washing machine is patented by Noah Cushing of Quebec. 1845 Death: Andrew Jackson, 7th president of the United States, buried in Hermitage Garden, Nashville, Tennessee. "...Until his election, every President had either been a member of the Virginia plantation elite, or had been named Adams. Jackson, nicknamed "Old Hickory," was neither of those. He was the first president who had lived on the American frontier, and thus the first not primarily associated with one of the original thirteen colonies. Jackson became the symbol of an era in American history â€” sometimes called the "Age of Jackson" or the "Jacksonian Era" â€” an era traditionally seen as dominating the years between the War of 1812 and the Civil War. Born in a backwoods settlement in the Waxhaws area in the Carolinas on Mach 15, 1767, he received a sporadic education. At age thirteen he joined the Continental Army as a courier. He was captured and imprisoned by the British in the American Revolutionary War. When he refused to clean the boots of a British officer, the irate redcoat slashed him with a sword, giving Jackson scars he would carry all his life. ...As President, Jackson worked to dismantle the Second Bank of the United States. The original Bank of the United States had been introduced in 1791 by Alexander Hamilton as a way of organizing the federal government's finances. This first Bank lapsed in 1811. It was followed by the second Bank, authorized by James Madison in 1816 to alleviate the economic problems caused by the War of 1812. Both Banks were instrumental in the growth of the U.S. economy, but Jackson opposed the concept on ideological grounds. Jackson remained influential in both national and state politics after retiring to The Hermitage, his Nashville home. Though a slaveholder, Jackson was a firm advocate of the federal union of the states and declined to give any support to talk of secession. He died at the Hermitage in 1845. Fittingly enough, his pet parrot was removed from his funeral for swearing. Ironically, due to his support for state rights, he was later considered as a philosophical forerunner of the Confederacy and was pictured on the Confederate $1000 bill." 1847 Birth: Ida McKinley, US First Lady. "Ida was born in Canton, Ohio, the elder daughter of a socially prominent and well-to-do family. James A. Saxton, a banker, educated his daughters well in local schools and a finishing school, and then sent them to Europe on the grand tour. While working as a cashier in a bank, she caught the attention of Maj. William McKinley, who had come to Canton in 1867 to establish a law practice, and they fell deeply in love. While he advanced in his profession, his young wife devoted her time to home and husband. A daughter, Katherine, was born on Christmas Day, 1871; a second, in April 1873. This time Ida was seriously ill, and the frail baby died in August. Phlebitis and epileptic seizures shattered the mother's health; and even before little Katie died in 1876, she was a confirmed invalid. As Congressman and then as governor of Ohio, William McKinley was never far from her side. She spent most of her waking hours in a small Victorian rocking chair that she had had since childhood; she sat doing fancy work and crocheting bedroom slippers while she waited for her husband. At the White House, the McKinleys acted as if her health were no great handicap to her role as First Lady. Richly and prettily dressed, she received guests at formal receptions seated in a blue velvet chair. She held a fragrant bouquet to suggest that she would not shake hands. Contrary to protocol, she was seated beside the President at state dinners and he, as always, kept close watch for signs of an impending seizure. If necessary, he would cover her face with a large handkerchief for a moment. Guests were discreet and newspapers silent on the subject of her "fainting spells." Only in recent years have the facts of her health been revealed. After the President was shot by an assassin in September 1901, after his second inauguration, he murmured to his secretary: "My wife--be careful, Cortelyou, how you tell her--oh, be careful." After his death, she moved back to Canton, and was cared for by her younger sister and visited her husband's grave almost daily. She died in 1907, and lies entombed beside the President and near their two little daughters in Canton's McKinley Memorial Mausoleum. 1861 Tennessee becomes the 11th and last of the southern states to secede from the Union. 1867 Birth: Frank Lloyd Wright, architect. 1869 Ives W. McGaffey of Chicago, Illinois receives a US patent for the suction vacuum cleaner. 1872 The US Congress authorizes the penny postal card. 1902 Boer War: Military peace celebrations are held in Bloemfontein and Pretoria. 1916 Birth: Francis Crick, discoverer of the structure of DNA. 1921 Birth: Suharto, longtime president of Indonesia, 32 years; will resign in May 1998 after nationwide protests against his autocratic rule. 1925 Birth: Barbara Bush. "...Barbara Pierce Bush (born June 8, 1925) is the wife of the 41st President of the United States, George H. W. Bush, and was First Lady of the United States from 1989 to 1993. She is the mother of current U.S. President George W. Bush and Florida Governor Jeb Bush, and the sister of Scott Pierce. Barbara Pierce was born to Pauline and Marvin Pierce, who later became president of McCall Corporation. She grew up in the suburban town of Rye, New York, near New York City and went to boarding school at Ashley Hall in Charleston, South Carolina. Her ancestor, an early New England colonist named Thomas Pierce, was also the ancestor to Franklin Pierce, the 14th President of the United States. It was at a dance during Christmas vacation when she was 16 that she met George H. W. Bush, a senior at Phillips Academy in Andover, Massachusetts. One and a half years later, the two became engaged, just before George went off to war during World War II as a Navy torpedo bomber pilot. When he returned on leave, Barbara had dropped out of Smith College in Northampton, Massachusetts. Two weeks later, on January 6, 1945, they married. After the war, George graduated from Yale University, and they moved to Midland, Texas. Six children were born to them: George; Pauline Robinson "Robin" (December 20, 1949 - October 11, 1953, died of leukemia); Jeb; Neil; Marvin, and Dorothy Walker (August 18, 1959 - ). Meanwhile, George built a business in the oil industry. Barbara's family moved twenty-nine times during the years that she and George H. W. Bush were married. She managed her family while her husband was away, as her husband obtained a menagerie of government jobs. Today Barbara Bush lives with her husband in Houston, Texas. The Bushes also have family summer home in Kennebunkport, Maine. They are frequent honored guests at the White House." 1928 Sir Charles Kingford-Smith makes the first flight between the US and Australia. 1928 Chiang Kai-shek's nationalist army secures the surrender of Peking after two days. 1930 King Carol II returns from exile to resume the throne of Romania. 1934 Latvia begins large-scale roundups of Socialists. Many Jews are arrested. 1937 Spanish Civil War: June 8-9 Air raids on Madrid, Barcelona, Bilbao and Valencia cause heavy damage and loss of life. 1940 WW2: The Polish submarine Orzel is lost in Norwegian waters with six officers and forty-nine seamen. 1940 The discovery of element 93, neptunium, is announced. 1941 WW2: British and Free French forces enter Vichy-held Syria from Iraq, imposing an armistice that gives Britain control over Syria and Lebanon. Note: The Vichy Government had been allowing Germans forces to use Syria as a base. 1944 WW2: SS-Panzerdivision Das Reich, harassed from all sides by French partisans, finds numerous roads blocked on the way to Normandy. The French partisans launch a massive attack on the German garrison of Tulle. SS-AufklÃ¤rungsabteilung 2 (Wulf) races to the besieged German troops. 1945 WW2: The Japanese cruiser Ashigara is sunk by a British submarine after evacuating 1200 men from Batavia. 1947 Eva Peron, wife of President Juan Peron, is given a tumultuous reception in Madrid by General Franco, a rare greeting by the Spanish dictator for an international dignitary. 1953 The US Supreme Court rules that restaurants in the District of Columbia cannot refuse to serve blacks. 1955 Birth: Tim Berners-Lee, inventor; the World Wide Web. 1957 Birth: Scott Adams, cartoonist, Dilbert creator. 1965 The Nam: US troops are given the authorization to engage in offensive operations in South Vietnam. 1965 Luna 6 is launched by the USSR, but misses the Moon. 1967 Six-Day War: Israeli aircraft and torpedo boats attack the USS Liberty in international waters off Egypt's Gaza Strip. The intelligence ship, well-marked as an American vessel and only lightly armed, is attacked first by Israeli aircraft that fire napalm and rockets at the ship. The Liberty attempts to radio for assistance, but the Israeli aircraft blocks the transmissions. Eventually, the ship will be able to make contact with the US Carrier Saratoga, and 12 fighter jets and four tanker planes are dispatched to defend the Liberty. When word of their deployment reaches Washington, however, Secretary of Defense Robert McNamara orders them recalled to the carrier, and they never reach the endangered Liberty. The reason for the recall remains unclear. Back in the Mediterranean, the initial air raid against the Liberty was over. Nine of the 294 crew members are dead and 60 are wounded. Suddenly, the ship is attacked by Israeli torpedo boats, which launch torpedoes and fired artillery at the ship. Under the command of its wounded captain, William L. McGonagle, the Liberty manages to avert four torpedoes, but one strikes the ship at the waterline. Heavily damaged, the ship launches three lifeboats, but these are also attacked in violation of international law. Failing to sink the Liberty, which displaces 10,000 tons, the Israelis finally desist. In all, 34 Americans are killed and 171 are wounded in the two-hour attack. In the attack's aftermath, the Liberty manages to limp to a safe port. Israel will later apologize for the attack and offer $6.9 million in compensation, claiming that it had mistaken the Liberty for an Egyptian ship. However, Liberty survivors, and some former US officials, believe that the attack was deliberate, staged to conceal Israel's pending seizure of Syria's Golan Heights, which occurred the next day. The ship's listening devices would likely have overheard Israeli military communications planning this controversial operation. Captain McGonagle will later be awarded the Congressional Medal of Honor for his heroic command of the Liberty during and after the attack. 1968 Authorities announce the capture in London of James Earl Ray, suspected assassin of civil rights leader Dr. Martin Luther King Jr. He is traveling under an assumed name with a Canadian passport. 1969 The Nam: US President Richard Nixon meets the South Vietnamese leader on Midway Island and announces the withdrawal of 25,000 troops. 1969 Spain closes the frontier with Gibraltar hoping to cripple the economy after Britain's refusal to hand over the colony to Spain. 1973 Death: Emmy Goering, Hermann Goering's second wife (1935). An actress, who used the stage-name Emmy Sonnemann, she became practically the "first lady" of the Third Reich. Sentenced to one year in a labor camp and five years performance ban. Thirty percent of her private assets were seized after the war. 1975 The USSR launches the Venera 9 to explore Venus; the first vehicle to send back pictures and surface data from Venus. 1982 Ronald Reagan becomes the first US president to address a joint session of the British Parliament. 1986 Despite allegations that he had been involved in Nazi wartime atrocities, Kurt Waldheim is elected president of Austria. 1989 Chinese Premier Li Peng reappears on TV, praising a group of army soldiers for their role in crushing the student-led pro-democracy movement. 1989 At a Greenpeace Rainbow Warrior's press conference, vegetarian Chrissie Hynde claims that she once firebombed a McDonalds Restaurant. The following day a McDonalds in Milton Keynes is firebombed and Hynde is threatened with legal action. 1990 After four decades of Communist rule, Czechoslovaks give a sweeping election victory to former dissidents of the Civic Forum movement. 1990 Israeli Prime Minister Yitzhak Shamir announces he has succeeded in forming a new right-wing coalition government, ending a three-month-old political crisis. 1993 Death: Rene Bousquet, the regime police chief of Vichy, France during WW2, shot dead at his Paris home in the Avenue Raphael by a lone gunman. 1994 Bosnia's warring factions agree to a one-month cease-fire. 1995 US Marines rescue Captain Scott O'Grady, whose F16-C fighter jet had been shot down by Bosnian Serbs on June 2. 1996 China detonates a nuclear explosion at the Lop Nor test site in northwestern Xinjiang with a blast that rocks the remote region. 1999 The United States, Russia and six leading democracies authorize a text calling for a peacekeeping force in Kosovo. 1999 President Clinton tackles another clear and present danger as he announces new restrictions aimed at making it tougher for teens to sneak into R-rated movies. 2000 Britain's defense attache in Greece, Brigadier Steven Saunders, is shot dead while on his way to work in Athens.